Anchorage Motel is located at 2 Marsden Road, Paihia, Bay of Islands. The Bay of Islands is situated approximately 250km north of Auckland. When travelling between Auckland and Northland you have a choice between using the Northern Gateway Toll Road – an extension of State Highway 1 – or one of the free alternatives. It costs $2 for a car to use the toll road and $4 for heavier transport. Operates daily flights from Auckland Airport to Kerikeri Airport. The flight time is approximately 45 minutes. 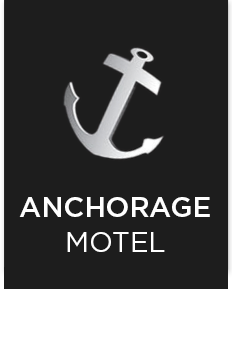 A shuttle service is available from the airport to Anchorage Motel. Flys twice daily Monday to Friday, and once daily on Sunday afternoons between Kerikeri, Whangarei and North Shore City in Auckland. Complimentary van shuttle transfers between Auckland CBD, Smales Farm and North Shore airport in either direction are included in your fare. Operates a daily luxury express coach service from downtown Auckland to the Bay of Islands. The Bay of Islands is only 3.5 hours drive North of Auckland via State Highway 1. If you choose to travel via Waipoua forest (the largest Kauri forest in NZ) and home of “Tane Mahuta” add two hours onto the journey.